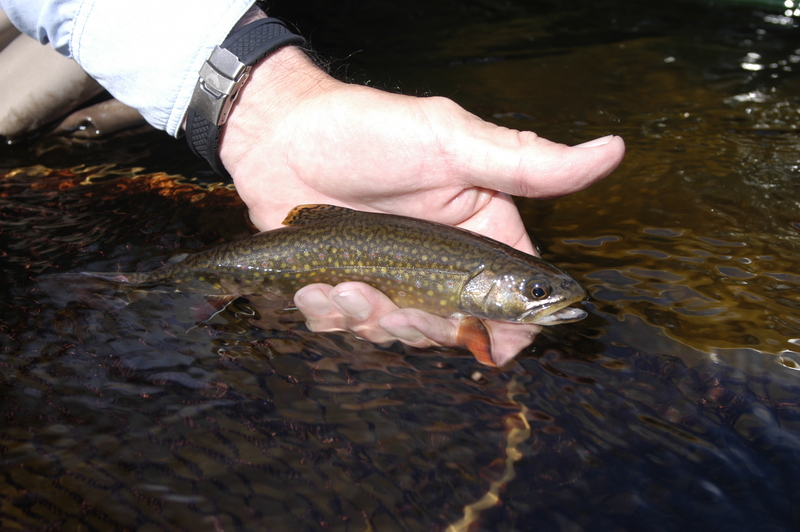 Marquette, Mich – State fisheries officials may be swimming upstream on the issue of brook trout regulations for the Upper Peninsula. A Michigan Department of Natural Resources proposal to double the daily creel limit from 5 fish per day to 10 fish per day has run into a stiff current of opposition in the U.P. Of approximately 100 people who attended eight public meetings this spring, half were opposed, according to state officials, who initially believed most Upper Peninsula anglers supported the idea. State officials unveiled the regulations earlier this spring after two Natural Resources Commission members, JR Richardson and John Madigan, pushed to have the agency revisit the regulations which cut the creel limit from 10 to 5 in 2000. Richardson, also president of the Upper Peninsula Sport Fisherman Association, said there was no reason to keep the creel limit low. Anglers in the UP wanted to see it increased. “Everyone has said it’s not a biological issue, so I said ‘What is stopping us from doing it,’” Richardson said. “It used to be 10 fish and that is what people remember. They are comfortable with that, two guys fishing catching 10 fish apiece. Not everyone, though. Brad Petzke, a Marquette fishing guide and owner of River’s North Guide Service is fuming about the regulations. So much so he started a petition against it and has gathered hundreds of signatures. “JR is the voice that many people hear because he is on the NRC,” Petzke said. “But I am adamantly opposed to the 10 fish limit. The science behind it is very out of date. Petzke is not alone in his concern. His voice is one in the growing clamor being expressed by local anglers, Trout Unlimited chapters and brook trout researchers at two Upper Peninsula Universities, along with the US Fish and Wildlife Service. “I would like to see regulations based on biology rather than sociology,” said Casey Huckins, a biology professor at Michigan Tech in Houghton. Huckins is an expert on brook trout who is working to reintroduce coaster brook trout in the Upper Peninsula. “When we are dealing with a native species, biology has to be at the forefront of the decisions. I am not fully convinced by the (limited) biology that has been presented for public review, Huckins said. State officials say the proposed increase is largely for social reasons, not biological. Upper Peninsula anglers have complained that five fish is not enough and if they spend $4 a gallon for gas they want to bring more home. “Some folks in the U.P. got the ear of the NRC members up there and we said we would look at it. If we found nothing of concern, we would change the limit for the Upper Peninsula,” said Brian Gunderman, a DNR fish biologist who is spearheading the regulations change. He is also the chairman of the state’s Coldwater Resources Steering Committee. The push-back doesn’t surprise Gunderman. The 5 fish limit has been in place for a decade or more. UP anglers have grown comfortable it, he said. As of this writing, 1200 anglers had filled out the DNR’s online survey about the proposed rule. Gunderman did not know how many opposed. Jill Leonard, a professor of biology at Northern Michigan University in Marquette, is studying brook trout in UP streams. She is troubled by the blanket rule and thinks a wise approach would be “more conservative regulations designed for the maintenance of the population.” Going to 10 fish, she said, could have a negative impact on smaller streams. “It’s a doubling of harvest and that’s a big change,” Leonard said. “I’d prefer to have more data and then decide. That’s also Jerry Maynard’s view, the vice president of the Fred Waara chapter of Trout Unlimited in Marquette. “We’re opposed to the change,” Maynard said. “We’d prefer to stay at five fish until the DNR can show us hard science that shows the fish won’t be impacted. Henry Quinlan, a fishery biologist with the US Fish and Wildlife Service is concerned that doubling the creel could have an adverse impact on coaster brook trout streams. His agency is working to restore the coasters. He said the FWS plans to provide the DNR with comments for consideration. “We think there are other things to consider,” Quinlan said. Surveys and computer modeling show little impact by raising the creel limit, according to Gunderman. The DNR also has no money to pay creel clerks to go out and get fresh data. Size limits are more important, he said. Type III trout streams have a 15 inch size limit and anglers can take no more than three fish. That rule will stay in place even if the creel limit goes up, he said, calling it “effectively a no-kill stream” because so few 15 inch fish are caught. Type II streams have a 10 inch size minimum and surveys show anglers rarely catch 5 keepers. “People don’t catch more than five so this rule change is not going to affect the population,” Gunderman said. The on-line survey at http://www.surveymonkey.com/s/BrookTroutRegulations will remain open until May 25. The findings will be summarized and presented to the Natural Resources Commission in September. This entry was posted in Uncategorized and tagged Brook Trout, Conservation, DNR, Fishing, Trout. Bookmark the permalink.